Are you eager to see different places but give up as you get car sick? Car sickness is one of the types of motion sicknesses that are commonly seen in people. Depending on the cause, it can also be referred to as air sickness, sea sickness etc. Motion sickness or travel sickness (also called Kinetosis) is a general term used to describe an unpleasant combination of symptoms like headache, yawning, dizziness, nausea and vomiting. The cause of motion sickness is that it functions as a defense mechanism against neurotoxins. When you are in motion, the inner ear transmits a neurotoxin to the brain signaling to the brain that it is in "motion". But, the eyes tell the brain that everything is still. As a result of this confusion, the brain will come to the conclusion that one of them is hallucinating and further conclude that the hallucination is due to poison ingestion. The brain responds by inducing vomiting, to clear the supposed toxin. The symptoms of motion sickness stops when the motion that caused it stops. It usually lasts for a few hours, but in some people the symptoms may last for 2 to 3 days after the trip is over. • Knowing the science behind it helps your body to be prepared for the condition. • Focus on non-moving objects like the horizon. This helps to resolve the causes of the sickness. • Avoid reading or playing a game which involves focusing on a fixed point and do not turn or look side to side often. 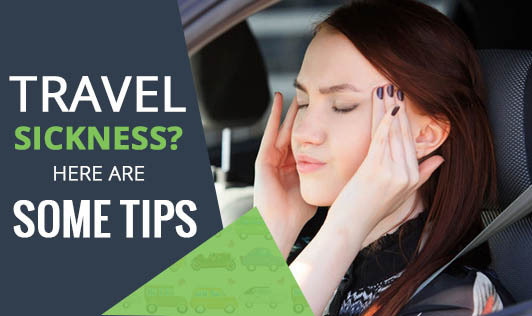 • If you are travelling by car, then the best thing would be to drive as you tend to focus on the road or sitting on the front seat with the driver may help as you get more window space and is less bumpy as compared to sitting on the seat behind. • Close your eyes or try to sleep - whichever helps to reduce the symptoms. • Keeping the windows open so that you can smell some fresh air helps reduce any strong smell like fragrances, perfumes or the smell of food that may elevate the symptoms. • Consuming products made of ginger root like ginger tea, ginger biscuits are effective. • Listening to music can keep your mind diverted from the sickness. • For temporary relief, you can ask for wrist bands or acupressure bands which are available in local pharmacies. Over the counter medications are available, but a majority of them have side effects and hence are not advisable. So the next time you travel, make up your mind to enjoy the wonderful sceneries and fresh air. Don't forget to top it with your favorite music. Happy travelling! !